This hwatu (화투) pack has 48 cards, 2 title cards and 5 jokers, 2 of them being "do it yourself". 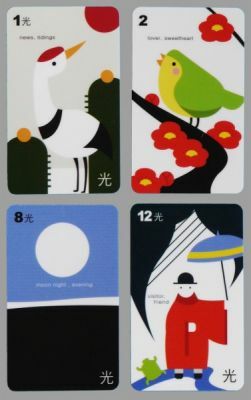 It is a stylised version of the tradition hwatu cards. To help the players, indices from 1 to 12 have been added and the colour scheme help further to distinguish each family. The card size is 40x66 mm which is 20% larger than usual. They are made in PVC and acrylic. The cards presented here are from the pine (1), the plum blossom (2), the pampas grass (8) and the willow (12) suits.